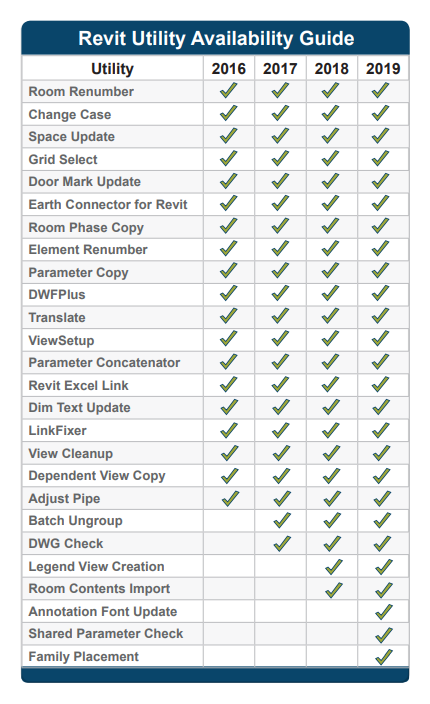 IMAGINiT Utilities for Revit 2019 supports only Revit 2019 products. We also offer versions for Revit 2016, 2017 and 2018. Available in either Standalone or Named-User versions. Scan for all font references in your model and push updated fonts with an easy-to-use wizard. Scan your model for shared parameters that should be migrated to your centralized file, or inconsistent shared parameter identifiers and type/instance settings. Allowing you to maintain more effective shared parameters for everyone. Look at families that are in a folder structure and - with just 2 clicks - load and place them. Family Placement runs as a Palette inside Revit, so it's available whenever you need it. If your project has a large number of families, this tool will save significant time. *These tools only in IMAGINiT Utilities for Revit 2019. Try IMAGINiT Utilities for Revit free for 14 days. Get help creating legend views for components used in your project. Quickly bring in all the required components for a given room. Save yourself from the mind-numbing task of ungrouping multiple groups in your model. Locate and identify AutoCAD drawings brought into your Revit model as links or imports. Reach out to Utilities support with all the relevant information about your Revit environment, simply. Automate the creation of dependent views, based on an example set. This utility handles view naming, crop regions, splits and more. This tool provides a wide variety of ways to adjust pipes so that they will trim together, and you can keep on piping. Helps reduce file size and reduces the time you need to clean up excessive views from Revit models. Update model links quickly and easily. Re-path a single model or several folders’ worth of information. Export Revit project data to Excel and Import data from Excel to a Revit project. Use filters to control what you want to export, include information like what view on which a particular item appears. For importing, you can create elements you want to have in your model based on the spreadsheet, including rooms, spaces and sheet placeholders. Eliminate tedious manual input of room names and numbers in different places. Seamlessly transfers and copies room names and numbers from the linked Revit architecture model to the MEP model. Easily renumber existing rooms into an order defined by selection. Insert rooms into an existing series with the subsequent room numbers “shifted” to make space for the inserted one. Enjoy the same kind of capabilities as Room Renumber, but with other element types like grids, levels, doors, windows, and spaces. You can either renumber based on a selected order or insert a new number and shift the existing ones. You could also use a line to draw a path to create your renumbering sequence. Finds gaps and allows you to re-sequence in order. Instantly match your organization’s or client’s standards on naming with UPPER CASE, Title Case, or lower case. This tool scans your model and automatically fixes “case issues” to whatever standard you specify. You can also configure what you want to change, like updating the case on parameters and elements only. Working with clients in other languages? Powered by Google Translate™, you can use this utility to automatically translate notes and room information from the current drawing language. Includes additional configuration for special words and words that should not be translated. Override multiple dimensions using chosen text options. Assemble multiple parameter values into a single text parameter using a custom expression. Create DWF files with more BIM information - whether augmenting parameter data in 2D and 3D, adding hyperlinks, or creating new viewpoints to highlight content, DWFPlus will make your DWFs into the deliverables you expect from Revit. Cover all the levels, phases and types of views you want with information presented to you in the ViewSetup utility in a grid, you can easily generate dozens to hundreds of new views with ease. Select Revit elements based on the grid they are on. Select walls, columns, beams and more. Choose the current level or all levels and select collinear or touching beams. Make door marks refer to the room that the door swings into. Enables you to inspect and override the suggested marks and updates the marks. Also provides user-specified suffixes. Watch your building come together, phase by phase, within Google Earth. This utility supports Revit Phases working with Google Earth time spans. More Revit users are employing Revit’s Phases to represent as-builts or multi-phase projects, but Revit’s Rooms are limited to a single phase. The Room Phase Copy tool makes it easy to copy Rooms from one phase to the same location in another phase and push updates on an ongoing basis. Easily copy information between parameters across the whole Revit model. Whether moving parameters for type to instance, host to element, room to component or even just switching to a new parameter, this utility takes a grueling task and makes it easy. Clients who are annual subscribers of Autodesk products though IMAGINiT may download a free copy of IMAGINiT Utilities for Revit from the ProductivityNOW Portal. IMAGINiT Utilities for Revit is brought to you by IMAGINiT Technologies. It's free for subscribers of Autodesk products though IMAGINiT. For others, it's priced at US $195.00 for a standalone license or $995.00 for a network license. There's more information available on the IMAGINiT Technologies website.